Shopsmith's Hook-and-Loop Disc Sanding System provides a natural cushion for cooler, more efficient sanding. It lets you change sandpaper discs from grit-to-grit in seconds without having to fire-up the oven, scrape or use solvents, as you would when replacing PSA discs. The system begins with a simple Hook-and-Loop conversion disc that has pressure sensitive adhesive on one side and "hooks" on the other. Just attach the PSA side of the conversion disc to a Shopsmith steel sanding disc and you'll be ready for some quick sandpaper changes and cooler, cushioned sanding with less heat build-up and smoother surfaces. 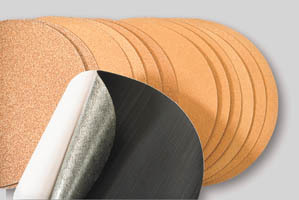 The sandpaper discs for this system are made with tough, durable, open coat aluminum oxide abrasives that are designed to resist loading during machine operations. The discs are backed with"loops", the other half of the hook-and-loop equation. When you're ready to start sanding with progressively finer papers, just start with a coarse disc to remove the stock quickly... change quickly to a medium disc for final sizing... then make another quick change to a fine disc to finish the process. This is clearly the best, most convenient disc sanding system you can have in your shop for instant grit changes, less workpiece burning and smother surfaces. Includes: • 12" Hook-and-Loop conversion disc plus • (2) packages of assorted 12" sandpaper discs (for a total of six fine, four medium and two coarse discs).